You’ll be fighting for the food at one of London’s best gastropubs. 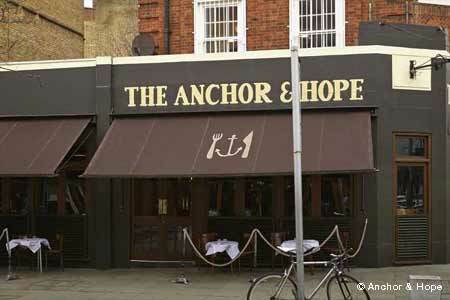 : Anchor & Hope is a real scene. Turn up at 5.15 p.m., make your booking and wait and hope. This top gastropub continues to run at full tilt, not surprising given the consistency of its cooking, the buzz of the place and the quality of its booze --- from good wines to classic cocktails and beers that cut the mustard with those in the know. Expect the likes of good British produce with a tendency towards offal. So it’s British asparagus in season, sliced ox tongue with lentils and green sauce, whole crabs, roast pigeon and signature lamb. Desserts delight. But it does get crowded and very busy, so if you’re in a rush you’d better go elsewhere.